Habanos has re-vamped the Vegueros brand. A lifting that includes a new logo and new tin packaging of 16 cigars. The blend is more powerful than the original Vegueros vitoles, but remains mild. We still find the grassiness, so familiar to this brand. Looking for a morning smoke? The new Vegueros Tapados fits the description perfectly. Nice and pleasant but not overpowering or complex. This is like a fat Petit Corona size (Mareva Gruesa), so the smoke will be round and long. Mild tobacco with herby/grassy aromas make for a ‘chilled’ smoke and a nice change from the Cuban powerhouses. Habanos has re-vamped the Vegueros brand. A lifting that includes a new logo and new tin packaging of 16 cigars. The blend is more powerful than the original Vegueros vitoles, but remains mild compared to some of Cuba's power smokes. We still find the grassiness, so familiar to this brand. Nice and pleasant but not overpowering or complex. This is like a fat Petit Corona size (Mareva Gruesa), so the smoke will be round and long. 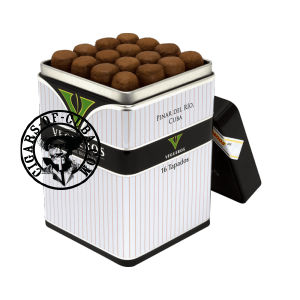 Mild tobacco with herby/grassy aromas make for a ‘chilled’ smoke and a nice change from the Cuban powerhouses.